Where: 7th Floor Gallery, Humanities Bldg. No jury, no fee, no return. Postal delivery only. MAKE A STATEMENT ABOUT THE ENVIRONMENT! 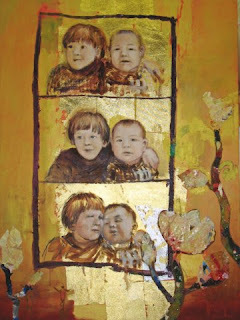 Paintings by Barbara Krol (aka: BASIA) at Shorty's Childrens Boutique. Have fun, drink wine, look at art, shop for great gifts. Even if you don't have kids- your friends do! Consider this – you have the opportunity to affect the direction, the governance, of an organization deeply committed to the interests of women artists. Balloting for Women’s Caucus for Art president-elect/President has been extended until January 30. You’ll find your ballot in the newsletter which was mailed recently. Please read the statements of both candidates for this office, and consider casting your vote for Jan Nesser, who currently serves as Vice-President for the Midwest Region. Because we have worked closely with Jan for a number of years we are enthusiastic in our recommendation to you. First, Jan’s commitment to women’s issues and women’s art is exemplary. She understands intimately the joys and difficulties that women face in academia; in employment; and in the production, exhibition and sale of art. She is pro-active for young women artists, both in academia and in community organizations. Jan is highly regarded as an instructor and has positively affected the lives of those she mentors. Her efforts have resulted in STL-WCA being involved with Viva Vox, an arts/mentoring organization for youth in need. She is equally sensitive to the concerns of emerging and established artists. Second, Jan organizational skills are outstanding. Her vision, her grasp of the possibilities, is complemented by the ability to discern the tasks necessary for success and to follow through when detail work is necessary. This combination of vision and task orientation is necessary for the position she seeks. Jan’s experience at all levels of WCA – local, regional, and national – will sensitize her to the needs of individuals in a variety of positions. Jan’s goals for WCA include issues of vision, growth, and structure. Third, Jan has the academic, community, employment, and personal experiences that enable her to work effectively in a variety of situations. Her energy, her ability to separate important components of a task from the mundane, and her dedication to women’s art will serve her well in leadership positions. We invite you to look again at Jan’s intent statement. And, finally, Jan is an outstanding, sensitive, skillful artist. Her work speaks intimately of the range of women’s issues. Jan utilizes a variety of techniques in engaging the viewer in considering one’s own involvement in sensitive, life-affecting experiences. We have worked with Jan Nesser for a number of years and find her to be effective, engaging, intellectually curious, and compassionate. We recommend her highly for your consideration. The Chicago Women's Caucus for Art invites you to a program featuring several artists who participated in Cool Globes: Hot Ideas for a Cooler Planet on Sunday, January 20, 2007, 2:00 p.m. at the Peter Jones Gallery, 1806 W. Cuyler, Chicago. The project was created to inspire and empower the public to take action against global warming. The globes were shown around Chicago last summer and fall. Come and meet Sandra Bacon, Linda Doyle, Andrea Harris, and Beth Shadur. The artists will explain their inspiration for their globes and talk about their techniques. Other Cool Globe artists may also participate. This is a free program, but donations are welcome! OPENING RECEPTION: Saturday, January 12, 4 - 7 p.m. A group exhibition of encaustic and tempera work on mixed media including ceramic, paper and wood, featuring encaustic painter Kathleen Waterloo and ceramic artists Jamie Lang, Dana Major Kanovitz and Corinne Peterson.